ABOVE: An ACTV inspector checks a passenger's ticket. ACTV really wants you to have a ticket that you've swiped against an electronic reader before you board. It's now illegal to be on a waterbus platform without a validated ticket, and stations are gradually being upgraded with paddle-style gates to encourage compliance. On a busy boat, the sailors who let passengers on and off don't have time to deal with fares and tickets, so you should always buy a ticket or Tourist Travel Card ahead of time if you can. If a vaporetto station doesn't have a ticket booth or machine, look for a nearby tabacchi shop (marked with a white "T" on a blue background) or a newsstand that sells ACTV tickets. Immediately upon boarding the water bus, approach the sailor who handles the boat's boarding gates and mooring lines. Ask for a "biglietto" (plural "biglietti"). If necessary, hold up your fingers to indicate how many tickets. Be prepared to pay in cash. Do not wait until an inspector asks for your ticket, or you'll be hit with the full fare plus a 60-euro fine. Important warning: Italian public services are seldom customer-oriented, and the left hand doesn't always know what the right hand is doing. Although the ACTV's published rules allow for paying once you're on board, the personnel on the boats may claim otherwise. If you board a water bus without a valid ticket, be aware that you're doing so at your own risk--regardless of the rules might say. 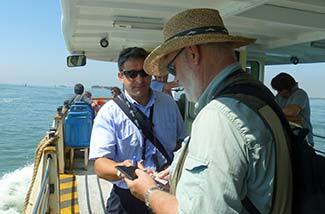 For more information on ACTV tickets and fares, see our Vaporetto Fares article.